Check out our SAN Winter 2011 Newsletter featuring recent SAN programs, activities and cases! (Artesia, CA) On Friday, November 19, 2010, at 10 am, South Asian community members gathered to hear numerous community stories presented at South Asian Network’s instrumental launch of our new report, “From Displacement to Internment,” in the heart of Los Angeles’ “Little India.” SAN held the press conference to share the pattern of human rights violations experienced by South Asians in Southern California over the last 20 years. Artesia’s Pioneer Boulevard bustles with sari stores, jewelry boutiques and Indian restaurants that cater to the thousands of South Asian immigrants who have settled into the neighborhood. 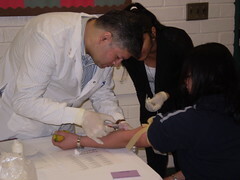 LAWNDALE, CA– 108 South Asian community members gathered as early as 8:00am at South Asian Network’s (SAN) first free health fair in the South Bay to access free health services. In these hard economic times, community members came with one goal in mind – to be able to get a basic health check up. SAN Launches New “Neighborhood Activities and Nutrition” Program for Older Adults at Artesia Community Center. ARTESIA, CA. South Asian seniors migrating to and reuniting with family in the U.S. oftentimes experience feelings of isolation and lack of belonging. Through intensive case management with South Asian seniors since 2003, South Asian Network (SAN) staff has noticed these concerns with elderly South Asian community members.